I am still learning some info, but it came to my attention and felt it needed to spread to friends in sport here on Sabong. Tommy Carrano from upstate New York was unlawfully raided and birds, memorabilia, even broke up fertile nests of eggs. There was some apprehension about timing and putting this info out, but by word from Tommy himself, and his friend Kayce Chadborn, it is time to get more friends involved. I spoke with Kayce Chadborn, with Stone County Gamefarm, and told him I wanted to help, and he gave me the go-ahead to put this post on here. So, Kayce has started a Legal Defense Fund and Auction on Facebook, for Tommy, and by all accounts Tommy is a stellar human, upstanding citizen, and has had an immensely positive impact out fraternity. I'll let people closer to the subject give more details, but just wanted people to know that Kayce and others have started an auction to try to help Tommy start a defense, that we all need to be in support of. Last edited by brothersgrimm; June 2nd, 2017 at 12:59 PM. A good friend encouraged me to put some fowl into the auction. So with my mentors approval, (for Tommy's cause) we put in two trios of fowl. Plenty of you have seen and asked about my BRs(Wingates, from Manziel, from Karl Guce) and Travelers (F.E. Montgomery, documented from several sources from Mr. Montgomery), and here is your chance at that blood. Send a friend request to Kayce Chadborn on Facebook, to be allowed/invited to the auction site. There are links from his page and from Stone County Gamefowl. Last edited by brothersgrimm; June 2nd, 2017 at 01:50 PM. Heard about this last weekend it is a bad deal. I gave some last weekend planning on giving more anyone that can afford to donate should so maybe he can beat this!! We need more people to the auction page. We have fowl there that will never again be offered to the public. This is a chance to obtain fowl, that otherwise can't be had. I have had more pms than I can count on here inquiring about my whitehackles. I listed a pair on the auction, so here is your chance to have them. There's something there for everybody. One fella is making some cool looking window decals of a gamecock silhouette that he is giving to people for a ten dollar donation. Another fella is auctioning custom handmade knives, and making them per the winners specs. They are awesome looking blades. People are offering collectable heels, and all sorts of other things. 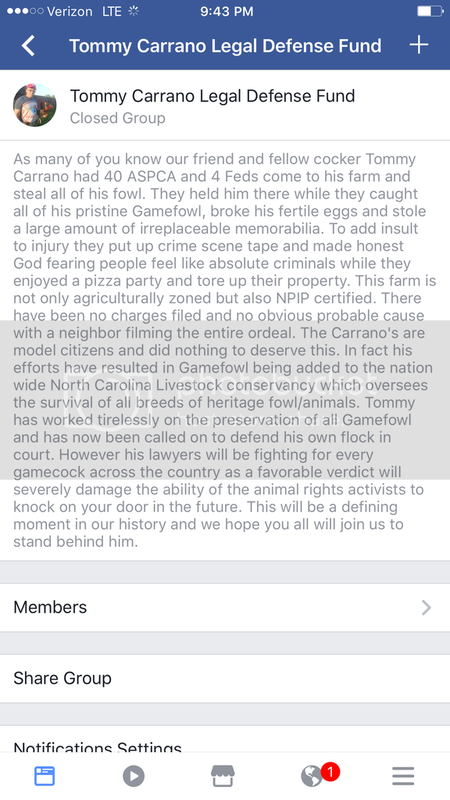 I will say that folks have came out of the woodwork for this, and are offering great fowl you wouldn't otherwise have access to. We appreciate all the donations, as well as bids. Come help out, and help us raise the funds needed for Tommy to fight this until the end! This is a case that could be a turning point for American breeders. This could set a precedent that we dearly need. Thanks! Last edited by steel city; June 2nd, 2017 at 09:12 PM. This is Tommy's legal defense fund. I just wanna encourage everybody to come over to the auction and look at the fowl posted. Whether your a big timer, or a backyard breeder. We got something for everyone. Last edited by steel city; June 2nd, 2017 at 09:51 PM. Neighbor DID video it, and has the trespassers on tape, coming onto their property looking for birds. Were the fowl euthanized ? I doubt it, they probably broke their necks. Man the video he posted on FB was depressing. He walked over his farm showing the pens without birds in them. Explaining how he used the pens and had them built to put them out of the extreme winter winds tgey have up there. Very nice setup he should be able to win his case. The very nice farm he has this is one that should gain some attention. I think BL Cozad is suppose to be trying to help. Last edited by steel city; June 3rd, 2017 at 12:17 AM. Count me in to this fight bro-grimm and sup-shamo.!!!! Seems this is where our sport has gone. We need to keep those drug heads and dope dealers out of our parties so when they get in trouble they dont know where we r.
Tommy has done more to promote the gamefowl industry in New York than anyone. For years the NYGBA was a name only. Thanks to Tommy the NYGBA has at least 3 shows a year throughout the state and he has helped increase the membership as well. I know some details on how this raid came about but it was not due to Facebook. As was stated the ***'s smashed hatching eggs, confiscated baby chicks as well as the adult fowl, and did not inventory what was taken. In addition he was held in his house while his property was searched for approximately 8-9 hours. By not allowing him to be present during the search was the perfect opportunity for evidence to be planted and property to be stolen. I hope to be at the next NYGBA show and hopefully we can collect more donations there for Tommy. I really believe they have picked on the wrong man here. He is not taking this lying down! Tell Tommy the Oklahoma boys are behind him. I plan on spreading the word this weekend to help out but I'm sure most are already aware of this issue. Im not the biggest fan of social media but this site is no different than Facebook. We have to get away from the run and hide mentality. And before someone says that's easy to say for someone with nothing to lose PLEASE. Pisses me off to no end ,that someday i may come home and find my farm tore upside down ,by none other than law enforcement, the ones we pay ,,, why cant these Enforcers see that the job they are told to do is Morally wrong ,my opinion is going onto anymans property un invited is wrong in itself , Hate to say i wonder if some law enforcement agencies share my same morals ,if they did they wouldnt steal mans possessions. I see this case as revolutionary, a turning point. 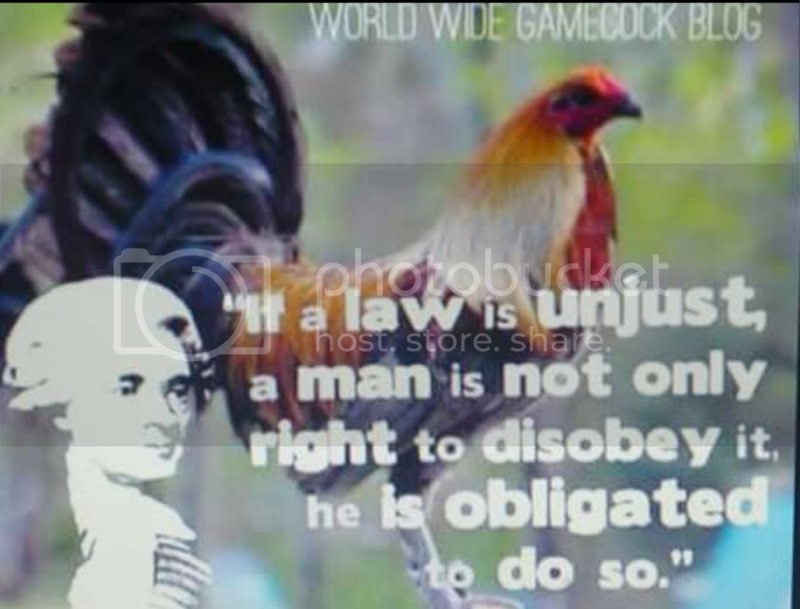 Our brothers in sport in the US (every gamefowl associations) need to unite and support this fight. This is the opportunity you have been waiting for to save and revive the sport you love. It will cost lots of money. But I believe this case is winnable in court. A number of constitutional rights have been violated here. This is your chance to hit back at ASPCA and H$U$ hard and gain some footing, legally. Need to show the citizenry that what they are doing is unconstitutional, and that the H$U$ and the feds need to stop harassing the law-abiding and peace-loving citizens of America, “the land of the free.” ... Then lobby to amend the laws sponsored by H$U$. Last edited by trans13; June 3rd, 2017 at 10:26 AM. From my understanding all states and national orgs are looking and helping however you are correct this is a time for the community to come together and put all else to side and support this matter. If you have Facebook just search "Tommy Caranno Legal Defense Fund"
We all need to finally make a united stand! More & more of us have become educated on our rights and have been fighting back! Stay game & fight the good fight in the courts! Lets all do what we can to help out! That's the way to go, man! This is gonna be a LANDMARK case for gamefowl breeders in the US. If Tommy wins this case, it will hit the freaking H$U$ hard and will give the gamefowl breeders leverage. But I have the feeling that they are gonna settle this out of the court. Regardless, it will be a huge win for the gamefowl breeders! Maybe we could get a auction going here on Sabong?! For the folks that don't do Facebook! Last edited by BackNBlack; June 3rd, 2017 at 01:19 PM.